Varsity Jacket are super popular across all ages! They are fashionable, functional & surprisingly lightweight! Not only can it make you look good outside on a cool weather day (since it’s so hot in Singapore! ), it can also keep you warm in the freezing office, or classroom or studios! MEOWPRINT carry different ranges of ready-stock custom varsity jacket in singapore for you to choose from. Our Recently Customized Varsity Jackets for inspiration! Are you looking for cheap custom varsity jackets for your class, groups or corporate companies? 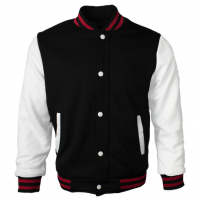 You can choose quality varsity jackets from our catalogue and customize them. For example, these are perfect for teenagers and youth to create their very own high school varsity jackets. These jackets are usually made from poly/cotton blend materials to make it feel and look great. 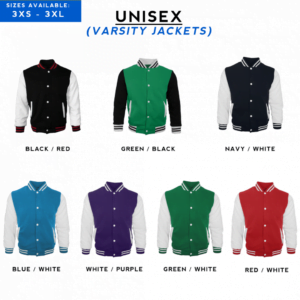 We are a varsity jacket supplier that carry different colors of ready-stock jackets! They are all unisex which means that they fit both varsity jacket mens and varsity jacket womens cutting! 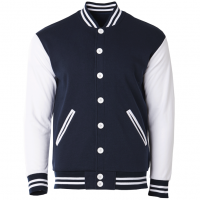 We are confident you will find a varsity jacket suited to your needs in our huge range of catalogue! Learn more about customizing varsity jackets below such as type of printing customization available, uses & many more! 1. What is a Varsity Jacket? Also known as letterman jackets & baseball jackets, Varsity Jacket emerges as the most commonly used term for this great jacket that has outgrown the college background it came from! These have become a fashionable apparel across all seasons, all year round. An unexpected combination of contrasting fabric for the sleeves (which are usually made from leather), contrast lining on the collar, waistband and cuffs made it one of the classic apparels that will last beyond its times. This is what makes it very fashionable and great to customize as well! People of all ages can learn to appreciate the fashionable varsity jackets. It can be used as a fashion statement, and at the same time functional enough to be able to carry lots of small personal belongings to keep them safe. Not only that, it can definitely keep you warm in a freezing environment. These custom jackets are popular items in our catalogue, mainly because many of our customers customize varsity jackets as class identity, groups such as dancers or athletes, as well as corporate companies for their corporate events! In fact, these jackets are so trendy, fashionable and functional, even top fashion brands such as Zalora SG sells them! We recommend these 3 printing methods as they work really well on the varsity jacket printing! Embroidery & Digital heat transfer printing methods work on all varsity jackets in our catalogue. Silk screen printing, however, works well on CRJ1100 Varsity Jacket at the point of writing this article. Let us share with you why. 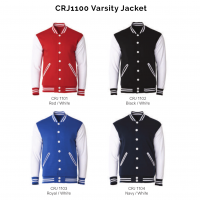 CRJ1100 Varsity Jacket is the only range in our varsity jackets that does not have an inner lining. This means that during the silkscreen printing process, the apparel will not shift and will hold firmly in place, making it feasible for silkscreen ink printing. Unlike the rest that has inner lining, this will cause the apparel to shift in between fabrics during the printing process, not making it feasible for silkscreen printing. However, both embroidery and heat transfer printing applies for all varsity jackets in our catalogue. There is a large area of imprint to print your unique designs on these varsity jackets. Most of our customers prefer to choose the left chest and back positions to imprint their designs for customization of the jackets. When you purchase wholesale varsity jackets in Singapore with us, you will be able to print varsity jackets in bulk at cheap prices so you can save on marketing costs, especially via the silk screen printing method. Even if you are looking for smaller quantities, do not worry! Just head over to the varsity jackets catalogue and get instant price quotations in seconds, today!